If you are in love with Italian food, then you must know that real Italian food is home cooked Italian food. No restaurant can beat the taste and the goodness of a hearty Italian meal cooked at home. If you have not tasted a home cooked Italian meal, you have not yet tasted authentic Italian food. However, you can taste some truly authentic Italian pasta which will make you feel like you have gone to Italy for a vacation and rented one of the Tuscany villa rentals with a chef who is making you the most delicious Italian dishes ever, here are two of the really common, really easy, quick to make yet insanely tasty pasta recipes for you. All of these recipes come from real Italian kitchens and you can prepare them in a blink of an eye. Spaghetti Aglio E Olio is one of the most simple pasta dishes you can make. In fact, the recipe is so simple that it seems a little underwhelming at first. The recipe comes straight out of the kitchen of Naples, and it only takes six ingredients and a maximum of thirty – thirty-five minutes to make this pasta dish from start to finish. However, take your first bite, and you will surely be blown away by the robust flavours of this really, really simple pasta. First, you need to boil your water to cook your pasta. Use a large pot and fill with water. Then bring the water to a rolling boil. Use ample amount of salt to season the water properly. As soon as the water starts to boil, put all of your pasta in. If you are using dried spaghetti, your pasta will take somewhere between 8 to 12 minutes to cook. If you are using freshly rolled pasta, it will be cooked in 3 to 6 minutes. Meanwhile, as your pasta is cooking, put the olive oil in a frying pan. Put your garlic slices in the oil and put the pan over heat to heat the oil up. Make sure your garlic does not get brown in colour, use low to medium heat. As soon as you see the garlic slices becoming crispy, take a ladle full of boiling pasta water and put it in the oil. This is an Italian trick no one will tell you. The starchy pasta water and the garlicky oil emulsifies and creates the beautiful sauce that we see in Spaghetti Aglio E Olio. Keep an eye on your pasta and take them out directly into the pan before the pasta gets fully cooked. The rest of the cooking will be done in the pan. Toss up the pasta and mix it with the beautiful sauce you just created. Just before the pasta reaches al dente stage, put the chopped parsley in. Mix thoroughly, and take the pasta out in your serving bowl. Ladle some extra sauce on top of the pasta. Sprinkle some red pepper flakes over the pasta to give it that added heat. Your delicious and authentic Spaghetti Aglio E Olio is ready. Spaghetti Carbonara is probably the most popular Italian dish that almost everybody has heard of, however, you can make Carbonara with almost any kind of pasta. This beautiful, versatile, rich dish not only tastes delicious, but it is also ridiculously easy to prepare the dish. There are a lot of versions of the recipe which float around, however, most of them are not the real Italian Carbonara. Many of these recipes call for garlic, cream or even parsley to be used as an ingredient, however, none of them is used while making the authentic Italian Carbonara. This authentic Roman recipe calls for an unfamiliar ingredient which can turn out to be hard to find outside Italy, however you can easily substitute it with a readily available replacement. Just like the previous recipe, we will put our pasta to cook. Heat water to a rolling boil, season the water properly and put the entire amount of pasta in. While the pasta is being cooked to an al dente stage, we will start making the sauce. In a separate burner, heat a frying pan first. Once the pan is nicely heated, put your chopped guanciale or the thick-cut bacon pieces in the pan. Make sure the bacon has loads of fat if you are using bacon, as this fat will get rendered and provide flavour to your entire pasta. After the fat renders properly, and the pieces of meat become crispy, add a splash of white wine to deglaze the pan. 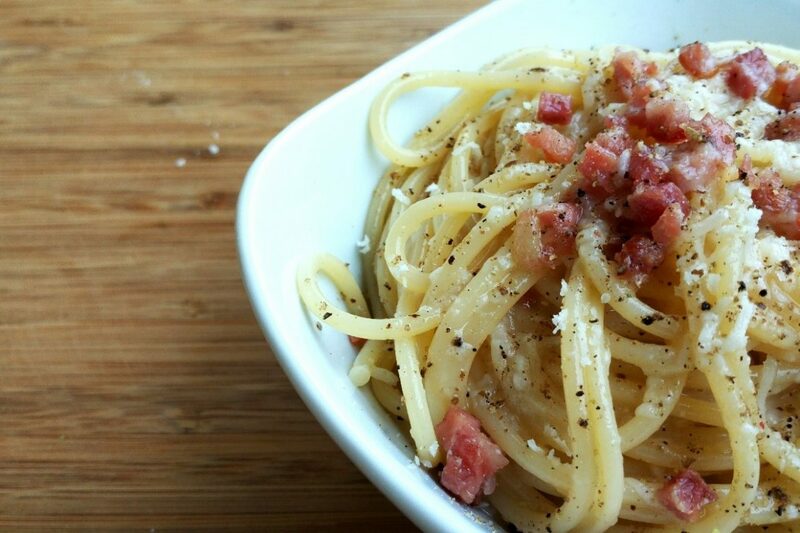 This step is optional, but it will give your carbonara a nice depth of flavour. Wait till the alcohol evaporates and then take the pan off the heat. After that, you will do something which only an Italian chef would do. Add a splash of chilled mineral water into the pan, to stop the cooking process and make the guanciale cold. Then crack the raw eggs into the pan. Mix the eggs with the cold guanciale and the rendered fat lightly. After that, as soon as your pasta is cooked to perfection, take the pan with guanciale and eggs back to the flame. Add the cooked pasta directly by straining it lightly, and don’t worry if a little bit of the pasta water gets added. Keep tossing the pan as the heat from both the pasta and the flame starts coagulating the eggs. As soon as your eggs come to a beautiful, silky, saucy texture, take the pan off the heat. Add the crushed pepper, Pecorino Romano and half of the Parmigiano Reggiano in the pasta. Toss lightly and transfer the pasta into a serving bowl. Garnish with the remaining Parmigiano Reggiano and voila! The most delicious Carbonara is ready to be enjoyed.